St. John’s, Newfoundland, Canada (CYYT), is frequently affected by extreme precipitation events, particularly in the cool season (October–April). 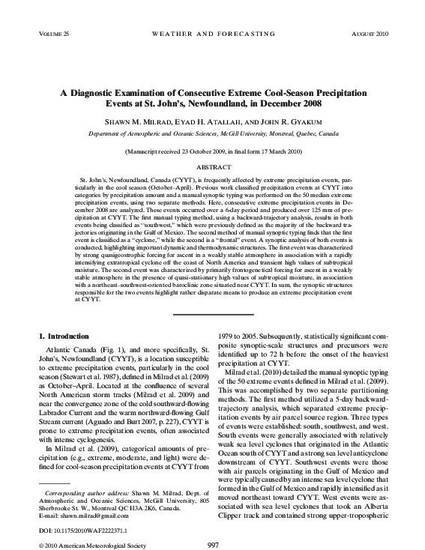 Previous work classified precipitation events at CYYT into categories by precipitation amount and a manual synoptic typing was performed on the 50 median extreme precipitation events, using two separate methods. Here, consecutive extreme precipitation events in December 2008 are analyzed. These events occurred over a 6-day period and produced over 125 mm of precipitation at CYYT. The first manual typing method, using a backward-trajectory analysis, results in both events being classified as “southwest,” which were previously defined as the majority of the backward trajectories originating in the Gulf of Mexico. The second method of manual synoptic typing finds that the first event is classified as a “cyclone,” while the second is a “frontal” event. A synoptic analysis of both events is conducted, highlighting important dynamic and thermodynamic structures. The first event was characterized by strong quasigeostrophic forcing for ascent in a weakly stable atmosphere in association with a rapidly intensifying extratropical cyclone off the coast of North America and transient high values of subtropical moisture. The second event was characterized by primarily frontogenetical forcing for ascent in a weakly stable atmosphere in the presence of quasi-stationary high values of subtropical moisture, in association with a northeast–southwest-oriented baroclinic zone situated near CYYT. In sum, the synoptic structures responsible for the two events highlight rather disparate means to produce an extreme precipitation event at CYYT. Dr. Milrad was not associated with Embry-Riddle Aeronautical University at the time this article was published.